The Terrier Hockey Fan Blog: A Quick Transition? Late this evening, there were indications all over the Internet that BU will name a successor to legendary coach Jack Parker during a Tuesday morning press conference. According a tweet by WHDH-TV Boston’s Joe Amorosino and a blogpost by Denver Post beat reporter Adrian Dater, former BU associate head coach and current Avalanche assistant David Quinn will be named the 11th head coach in the history of the Terrier hockey program. 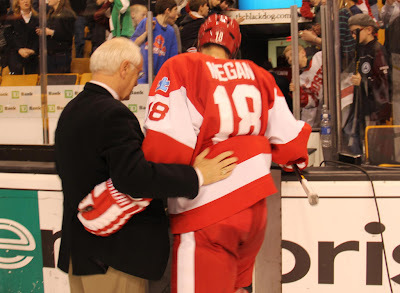 Both Dater and TSN’s Bob McKenzie have indicated that Quinn will finish out the current season as assistant to another former Terrier, Joe Sacco, before assuming the reins at Agganis Arena. Reports indicate that BU also spoke with New York Rangers assistant coach Mike Sullivan, who co-captained BU’s 1990 Final Four Team and Wilkes Barre/Scranton Penguins head coach John Hynes, a member of BU’s 1995 national champions and the 1997 Frozen Four squad. The 46 year old Quinn, a native of Cranston, R.I., was Parker’s top lieutenant for five seasons, culminating with the 2008-09 national championship season. Seeking further head coaching experience, Quinn took over the top job of the Avalanche’s AHL affiliate, the Lake Erie Monsters, a position held for three seasons before joining Sacco’s staff in Denver. Before his stint on the BU staff, Quinn was an assistant at Northeastern and Nebraska-Omaha and then spent two seasons as head coach in USA Hockey’s NTDP program, leading the U17s one year and then the U18s.A standout prep school blueliner at the Kent School, Quinn became a Minnesota North Stars’ first-round draft choice in 1984 and played three seasons at BU, before a blood disorder—Christmas Disease—put him on the sidelines. A brief comeback in the minor leagues ended in 1993. Freshman goalie Sean Maguire, who posted a .947 save percentage and a 2.04 GAA in the Hockey East semifinals and final, earned conference Rookie of the Week honors. Sean Escobedo (10 blocks in two games), Matt Nieto, Danny O’Regan and Evan Rodrigues were named to the top performers list. O’Regan became the first Terrier freshman to lead the team in scoring (38 points) since BU Hall of Famer Tony Amonte in 1989-90. Former Terrier Rick DiPietro recorded his fifth victory since being assigned to Bridgeport in the Sound Tigers’ 4-2 win over Albany. DiPietro stopped 19 shots including a penalty-shot attempt by former UNH Wildcat Phil DeSimone. David van der Gulik scored his 18th goal in Lake Erie’s 5-4 loss to Grand Rapids. The goal leaves him one shy of his AHL career best. #3 Terriers, playing in their second national championship game in three years, fell short again, losing, 6-3, to #1 Minnesota, which posted a remarkable, unblemished 41-0 record. BU fell behind, 2-0, before getting on the board with a Sarah Lefort power play goal late in the first period. The Gophers extended the lead to 4-1 in the middle stanza. Marie Philip-Poulin, injured early in the game, returned to score his 19th goal, but the Gophers countered again. Jennelle Kohanchuk's team-leading 25th cut the lead to 5-3, before an empty-netter closed out the scoring. In just eight seasons as a varsity program, BU remains the only Hockey East school to advance to an NCAA title game. The Terriers have won four NCAA tournament games, including two at Walter Brown Arena.